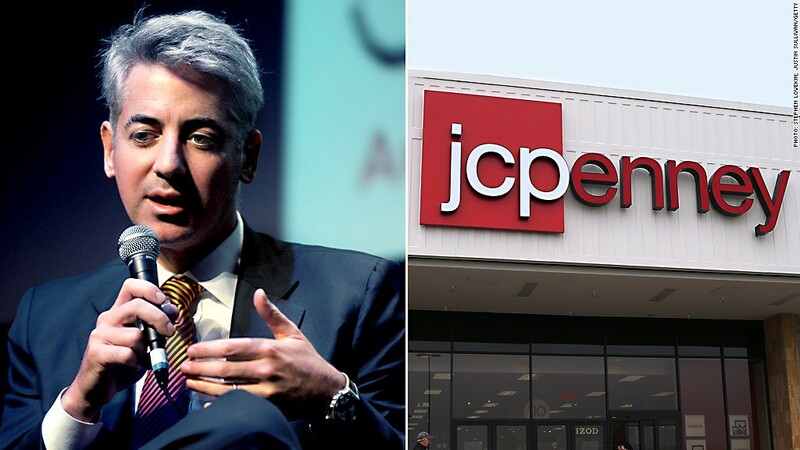 Activist investor Bill Ackman is selling his entire 18% stake in J.C. Penney. Shares of the troubled retailer have plunged 50% since Ackman first disclosed his stake in early October 2010. Activist investor Bill Ackman is cutting his losses in J.C. Penney. The hedge fund manager sold his entire stake in the troubled retailer. Ackman's Pershing Square Capital Management began buying J.C. Penney in October 2010 when shares were around $25 a piece. The hedge fund said it sold all 39 million of its shares to Citigroup (C), which is now offering the shares at $12.90 each. That puts Ackman's loss at nearly $500 million. The sale was disclosed by J.C. Penney (JCP) Monday in a regulatory filing with the SEC and in statements from Pershing Square. Ackman quit the Penney board earlier this month following disagreements about the company's leadership. Ackman initially brought in Ron Johnson, a former head of Apple (AAPL)'s retailing unit, to lead the Plano, Texas-based company. But Ackman ultimately agreed to get rid of Johnson earlier this year after his strategy drove away customers, resulting in repeated quarters of sinking sales. Just last week, J.C. Penney reported its ninth consecutive drop in quarterly revenue and posted another huge profit loss. Ackman hasn't been happy with interim CEO and Penney veteran Mike Ullman either, and was pushing to replace him sooner rather than later. But the board continued to support Ullman, forcing Ackman to step aside. After quitting the board, Ackman reached an agreement with the company that allows him to register to sell shares of J.C. Penney, so the market has been expecting the move. Still, some experts worry what Ackman's sale will signal to the market. On one hand, Ackman has "been privy to all sorts of information for a long time" and is willing to take a loss on his investment now out of "fear of losing more money," said Brian Sozzi, chief equities strategist at Belus Capital Advisors. But at the same time, Ackman is a well-known activist investor, and without the ability to influence the direction of the company, it makes sense for him to sell his stake, said Will Frohnhoefer, analyst at BTIG. And with the Ackman-J.C. Penney feud coming to an end, Penney executives will be able to focus on executing the company's makeover. "J.C. Penney showed some progress in its recent earnings, but it still hasn't proved it can pull of a turnaround," said Frohnhoefer. "Investors will now be laser-focused on sales, the broader trends in retail and any new material information for J.C. Penney." Shares of J.C. Penney were lower in premarket trading Tuesday. The stock has plunged more than 60% since the start of 2012 and more than 30% in 2013.